I am many things. I run, I write, I work. But out of all the dimensions of my life, it is writing I love the most. It is not only because my writing is the only part of me which will survive. It is because when I write, I put out a part of me on the paper. I am asked many times why I write in a peculiar way, with a certain sense of gloom hovering over it. It is because that is the way I think. It is the same with most writers and poets. We write, we breathe, we live. We die with every word we write and in those word, we sense the deepest sense of life. Writing is not easy. Literacy is far, far different from writing. Though, we do mix the two often. A strong vocabulary, a panache for words, the knowledge of some secret formula, lighter words, student life, young love. Writing is all that and more. Writing isn’t an alchemist’s magic formula, it is the agony of a heart which knows little and feels more. That heart, the thumping sense of our being thunders in the silent nights, laden with solitude. Writing requires one to dig deep into the flesh of that beating monster which houses the soul. No, it does not thump so hard for other people. They do not dig that deep into those dark contours of heart which house our deepest fears and over which shines on the reflected splendor of our most sacred hopes. This makes writing a very private and lonely affair. True, there will be book launches and speeches but the writer will long to get away from the intrusion of the crowd into his private world of penury. He lies there, alone. Solitude is the hallmark of a writer. Though there are some trend, some mechanization, some assembly line approach being proposed these days. They call it collaborative writing. I wonder if there is any such thing. It is this looming solitude, sometimes rapturously happy, at times maddeningly maudlin, but always private, always one man against the world around him. When we write, we try to find out and understand the relationship of that one man with the world around him, and the failings and victories emerging of that relationship. We need therefore kindred souls to hold hands to. We need people who are as alien to the rest of the world around us as we are. We look around to embrace the people who are the conscience-keepers of the world. We are not the people who can be satisfied with the why, we are the people who will ask why not? Rarely does social media responds to the call of such people. We are born with a rich vocabulary. With every heartless strike, one word dies. Poets are the people who guard, and nurse those dying words, being murdered every hour of the day. We offer our heads in place of words, we bleed for the words we save. We save them for the world so that world remains comprehensible to the people who are not willing to pay the price of the words without which we all will be lost. WH Auden captured this beautifully when he wrote, “Language is the mother, not the handmaiden, of thought; words will tell you things you never thought or felt before.” Poets bleed for people around. “A poet is an unhappy being whose heart is torn by secret sufferings, but whose lips are so strangely formed that when the sighs and the cries escape them, they sound like beautiful music. People crowd around the poet and say to him: "Sing for us soon again;" that is as much to say, "May new sufferings torment your soul.” Contends Soren Kierkegaard. Poetry keeps the poet alive, and some times, kills him. We need to reach out, support. Social media has been hailed as a marketing platform. But I do not know how true it might be. 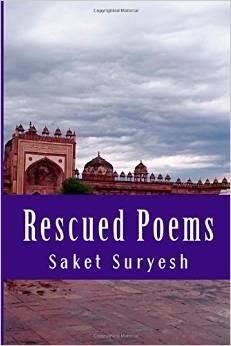 When poets and authors mingle with others suffering with the same agony, who will read? It is, I suppose, to keep the sanity, while some books sell on their own. We look at fellow writers, and encouraged by the fellowship of our agonies, write some more. There are some platforms, which I tried. On Google Plus, I tried multiple communities like Poetry etc. It wasn’t very encouraging. They were strict regulated communities. For instance, when I posted two poems in a day in one of the community, I was chided- only one poem in a week. What was that? Did google tell them to reduce the content? It pity those communities and suggest rather stay alone then be a part of such rigidly policed community. We need communities which touch our souls with the lightness of a loving feather. We don't need chains and a rule-book. To keep writing in the face of sneers.